I've been seeing these around Toronto lately, and I was intrigued. They are the brainchild of Luke Anderson, a wheelchair user who, like many people with mobility issues, has trouble gaining access to buildings because of one small step at the entrance. They are also of benefit to people with strollers and shopping buggies. For example; I buy a heavy bag of kitty litter at my local pet supply place, and I have no problem lifting it down the one step to the sidewalk, but I am relatively young (middle-aged), and completely able-bodied. An elderly person, or someone who's more fragile would have trouble with it. The ramps are brightly coloured and feature a rope handle for ease of installation and removal. So they can be brought inside after store closing to prevent theft, and during the winter months, if they're stored inside, they won't have to be shoveled if it's snowed over night. And I gather that they can be built to different heights and sizes. And here's an example designed for an entrance that's more than one step high, and does also hint that a flat platform unit at the top could be possible, depending on space. This one does have ridges on the edges as well. I'd love to hear what wheelchair users think. 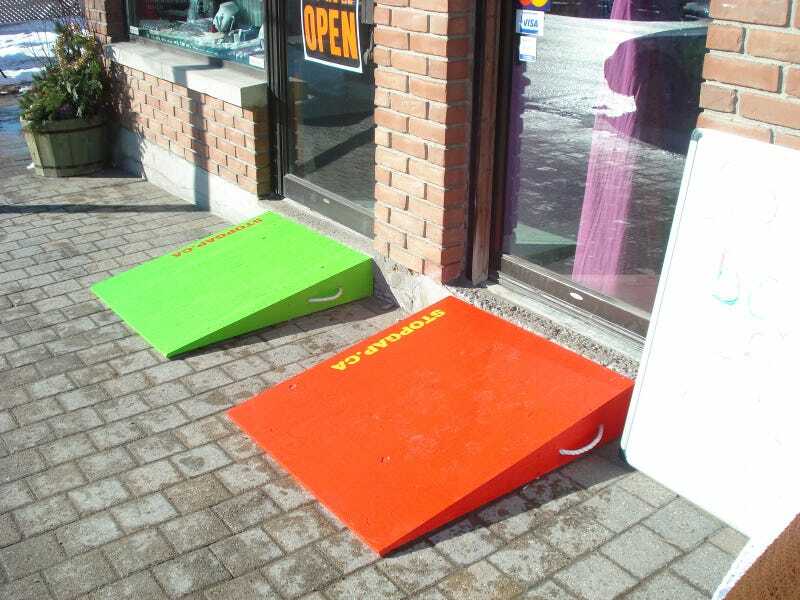 I've already passed on the information to my pet supply store, and encouraged them to contact StopGap for a ramp.